Those who linger late over wine, and who keep trying mixed wines. Do not look at it when it is red, when it sparkles in the cup and goes down smoothly. Robinson & Lawler (1977) wrote, "For about 9 million Americans chronic alcoholism severely affects health, job security, and family life." Pulse magazine (August 16, 1985) reported that, worldwide, alcohol abuse cost $100 billion per year, about 1/10 the cost of the arms race! In America 10,000,000 problem drinkers cost the economy $19 billion in lost production plus $14 billion in other costs. The 20th century produced about 300,000,000 problem drinkers and alcoholics worldwide. Kessel and Walton (1965) cited a study comparing families with alcoholic fathers with non-alcoholic families. Divorce or separation was 28% vs 4%. Children who teachers considered "problem children" were 48% vs 10%. • The liver becomes less efficient after several weeks of 3-4 drinks per night. • Regular heavy drinking weakens appetite leading to malnutrition. It's also linked to heart and brain damage. • Excessive alcohol reduces the production and activity of white blood cells, hence lowers resistance to harmful bacteria. • 10% of alcoholics develop a cirrhosis-damaged liver, which cannot produce bile (necessary to digest fats). Hodge (2004) reported: "Binge drinking is one of our most intractable and expensive health issues, costing $7.6 billion a year in lost production, absenteeism, injuries, death and disease." Pengelley (2007) reported: "231,705 children, aged 12 or less (13.2 per cent), live with an adult binge drinker. 40,272 (2.3 per cent) live with a daily cannabis user." Drunkenness promotes the opposite to "life" and "healing". The Bible does not directly discuss other drugs, but the same principles would apply. If it damages relationships, ruins health or promotes crime then its use should be stopped. Kelton (1998) reported: "Of a sample group of drug users surveyed for the study, half admitted committing a crime within the past four weeks." Tobacco has over 4,000 chemicals, many dangerous. Smokers age faster and have higher rates of cancer, heart disease and stroke. Brown (1994) reported: "Tobacco kills one smoker in two." Until the 1970s many argued that heavy drinkers are such by nature. Their genes make them crave alcohol; therefore they are not responsible. If heavy drinking or abstaining is a matter of "wisdom" – an attribute that can be learned – then it's also a matter of choice. I'd like to get rid of one of the fallacies of alcoholism. A majority of the work in the past on alcohol by psychiatrists and psychologists indicated that maybe the alcoholic had some gross personality disorder, neurosis or psychosis as the basis of his alcoholism. Our work leads us to believe, and the work of others incidentally, that in fact the reverse is true, that the alcoholic personality manifesting psychosis and neurosis is in fact caused as a result of the alcoholism. The results that we can achieve in reformatory work show that two thirds of those who suffer from alcoholism can recover. Harvard psychiatrist Dr George Vaillant authored The Natural History of Alcoholism: Causes, Patterns, and Paths to Recovery – discussed in Time magazine by Jane O'Rielly (1983). This landmark study started in 1940 and followed the lives of 200 Harvard graduates and 400 working class men. By observing the stages by which 26 graduates and 110 blue-collar workers became alcoholics the study investigated how this happened. Vaillant concluded, "There is a genetic contribution, the rest of it is due to maladaptive life-style…"
Therefore, going down that path and becoming an alcoholic is a succession of decisions. In Western legal systems criminals intoxicated while committing crimes often got lighter sentences or even no sentence. For example, a drunk driver of an unregistered car hit a cyclist, and kept driving with the victim wedged under the car. The killer's defence was that he was too drunk to remember. The manslaughter charge was downgraded in a plea bargain to causing death by dangerous driving. It's common knowledge that alcohol promotes poor judgment, weakens inhibitions and slows reflexes. Therefore the decision to enter such a state is the drunk's responsibility and should not be an excuse for crime. Permitting intoxication as an excuse "justifies" the drunk, is inconsistent with equality before the law, and increases the number of victims. Modern law is catching up to the Bible! Wine is also good for the heart. A 1974 study of 464 patients by Dr A. L. Klatsby of Guys Hospital in London found a correlation between alcohol consumption and fewer heart attacks. Physicians at the Medical Research Council epidemi-ology unit studied the effect of several diet elements on health in 18 major countries, including the United States. Beer and hard liquor do not have the same protective effects as wine, Dr Leger said. Watts (1999) says: "After decades of controversy, it looks as if a little booze really is good for us." Pregnant women who drink wine may harm their unborn child. (Gorman 2006) Cresswell (2007) reports that a pregnant woman ingesting five or more standard drinks in one sitting could give the fetus: "…fetal alcohol syndrome, which results in abnormal facial features, growth deficiencies and central nervous system problems such as difficulties with learning, memory, attention span, communication, vision and hearing." In 1784 American physician Benjamin Rush warned that drinking liquor risked one's physical and moral health. C.W. Hufeland in Berlin and T. Trotter in Britain made similar claims. As a result American Presbyterians passed resolutions against "intemperance" in 1811-1812. In 1836 the American Temperance Society endorsed complete abstinence from non-medicinal alcohol and convinced legislators in some states to ban liquor. "Temperance" became a social and political movement in Britain about 1850-1900. 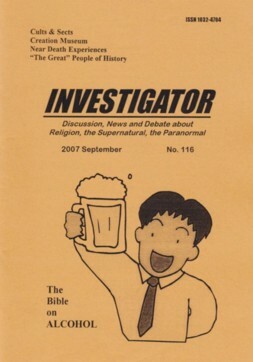 It moved from advocating moderation to prohibition and was backed by Christian denominations that oppose all consumption of alcohol. The USA enforced Prohibition in the 1920s. Prohibition failed because it transferred production and distribution of alcohol to criminals. Drunkards hurt themselves and their families and wrongly so. The cultural promotion of heavy drinking as "macho" contradicted science which revealed heavy drinking as dangerous. Legislators who assumed drunkenness is genetic and passed laws that exonerated people who committed crime under intoxication, acted contrary to science and were "an abomination to the LORD". Temperance organizations that opposed all alcoholic drinks were against the Bible too, because in moderation "Wine gladdens life." The middle ground, as in The Bible, was correct all along. Bagnall, D. The Bulletin, September 9, 2003, pp 20-26. Behr, E. 1997 Prohibition, BBC. Berridge, V. 2004 History Today, Volume 54 (5) May, pp 18-20. Borsay, P. BBC History, July 2005, pp 44-48. Brown, P. 1994 New Scientist, October 15, p. 4. Cresswell, A. The Weekend Australian, January 27-28, 2007, p.10. Gorman, C. 2006 Time, June 5, 2006, p. 63. Haran, P. 2002 Sunday Mail, January 6, p. 2. Heinz, A. Scientific American Mind, April/May, 2006, pp 56-61. Hicks, R. The Weekend Australian, May 26-27, 1979, p. 13. Hodge, A. The Australian, December 9, 2004, p. 14. Johnson, H. 1991 The Story of Wine, Mandarin. Kessel, N. and Walton, H. 1965 Alcoholism, Penguin. Macmillan, S. Sunday Mail, September 2, 1979. Maury, E. A. 1977 Wine Is The Best Medicine, Sheed, Andrews & McMeel. O'Rielly, J. Time, April 25, 1983, pp 48-49. Pengelley, J. The Advertiser, May 21, 2007, p. 9. Robinson, C. H. & Lawler, M. R. 1977 Normal and Therapeutic Nutrition, 15th edition, Macmillan, p. 520. Watts, G. New Scientist, November 27, 1999, pp 84-88. My article about "The Bible On Alcohol" included a quote that said: "Hard drinking was endemic in eighteenth-century society… Manliness required you to be a three-bottle a day man. Drink was built into the fabric of social life…"
London's 100,000 pubs, laid end to end, the heart of Booth's territory, every fifth shop was a gin-shop; most kept special steps to help even tiny mites reach the counter. Pubs featured penny glasses of gin for children; too often child alcoholics needed the stomach pumps. Children less than five years old knew the raging agonies of delirium tremens or died from cirrhosis of the liver. Others trudged through the Sunday streets bringing yet more gin to parents who lay drunk and fully clothed in bed, vomiting on the floor. These were the by-products of a $100 million a year trade, whose worst victims slept on heaps of soot beneath the arches of Blackfriars Bridge, living only for the next glass. But seventy years before Alcoholics Anonymous, Booth saw alcoholism for the sickness that it was. From these pubs he now began to recruit his first shock-troops – men who had known the craving for liquor from infancy.